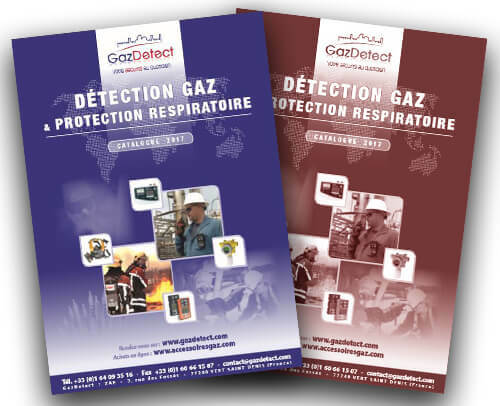 Here are gathered attributes of different hazardous gases encountered in industries, their different detection means (portable gas detectors or fixed systems) and well-suited respiratory protective equipment (gas mask or self-contained breathing apparatus). A gas is conventionally defined as a substance without any proper shape or volume. Thus, gas properties and chemical features vary from one gas to another. Almost every industry or field of activity produce or use specific gas. These gases have to be known in order to get proper detection systems and protection from their dangerous effects. For further information about features, chemico-physical characteristics and information on gases, visit our GazFinder website. This searchable database gathers information on around 1.600 gases. Besides pages on each gas and its technical specificities, you’ll find sections dedicated to gas categories – like volatile organic compounds – and hazardous substances classification. As part of its commercial activity and website management, the GazDetect company is recording and data and information via cookies. They are dedicated to help the company provide these online services, to improve the website and to maintain a secure environment. Users of this website can deactivate these cookies in their web browsers. This category is essential for the proper functioning of this platform. Allows advertisers to control the frequency and duration of ads shown to visitors. Measuring and managing the site's audience, they make it possible to establish statistics on user behaviour. Cookies used by Google services such as Google Map or Youtube. They concern geolocation, multi-device activity, preferences and the protection of users' login data. Please fill out the form below and we'll get back to you shortly. Country * ---FranceAfghanistanAlbaniaAlgeriaAmericanSamoaAndorraAngolaAnguillaAntigua and BarbudaArgentinaArmeniaArubaAustraliaAustriaAzerbaijanBahamasBahrainBangladeshBarbadosBelarusBelgiumBelizeBeninBermudaBhutanBosnia and HerzegovinaBotswanaBrazilBritish Indian Ocean TerritoryBulgariaBurkina FasoBurundiCambodiaCameroonCanadaCape VerdeCayman IslandsCentral African RepublicChadChileChinaChristmas IslandColombiaComorosCongoCook IslandsCosta RicaCroatiaCubaCyprusCzech RepublicDenmarkDjiboutiDominicaDominican RepublicEcuadorEgyptEl SalvadorEquatorial GuineaEritreaEstoniaEthiopiaFaroe IslandsFijiFinlandFranceFrench GuianaFrench PolynesiaGabonGambiaGeorgiaGermanyGhanaGibraltarGreeceGreenlandGrenadaGuadeloupeGuamGuatemalaGuineaGuinea-BissauGuyanaHaitiHondurasHungaryIcelandIndiaIndonesiaIraqIrelandIsraelItalyJamaicaJapanJordanKazakhstanKenyaKiribatiKuwaitKyrgyzstanLatviaLebanonLesothoLiberiaLiechtensteinLithuaniaLuxembourgMadagascarMalawiMalaysiaMaldivesMaliMaltaMarshall IslandsMartiniqueMauritaniaMauritiusMayotteMexicoMonacoMongoliaMontenegroMontserratMoroccoMyanmarNamibiaNauruNepalNetherlandsNetherlands AntillesNew CaledoniaNew ZealandNicaraguaNigerNigeriaNiueNorfolk IslandNorthern Mariana IslandsNorwayOmanPakistanPalauPanamaPapua New GuineaParaguayPeruPhilippinesPolandPortugalPuerto RicoQatarRomaniaRwandaSamoaSan MarinoSaudi ArabiaSenegalSerbiaSeychellesSierra LeoneSingaporeSlovakiaSloveniaSolomon IslandsSouth AfricaSouth Georgia and the South Sandwich IslandsSpainSri LankaSudanSurinameSwazilandSwedenSwitzerlandTajikistanThailandTogoTokelauTongaTrinidad and TobagoTunisiaTurkeyTurkmenistanTurks and Caicos IslandsTuvaluUgandaUkraineUnited Arab EmiratesUnited KingdomUnited StatesUruguayUzbekistanVanuatuWallis and FutunaYemenZambiaZimbabweland IslandsAntarcticaBolivia, Plurinational State ofBrunei DarussalamCocos (Keeling) IslandsCongo, The Democratic Republic of theCote d'IvoireFalkland Islands (Malvinas)GuernseyHoly See (Vatican City State)Hong KongIran, Islamic Republic ofIsle of ManJerseyKorea, Democratic People's Republic ofKorea, Republic ofLao People's Democratic RepublicLibyan Arab JamahiriyaMacaoMacedonia, The Former Yugoslav Republic ofMicronesia, Federated States ofMoldova, Republic ofMozambiquePalestinian Territory, OccupiedPitcairnRÃ©unionRussiaSaint BarthÃ©lemySaint Helena, Ascension and Tristan Da CunhaSaint Kitts and NevisSaint LuciaSaint MartinSaint Pierre and MiquelonSaint Vincent and the GrenadinesSao Tome and PrincipeSomaliaSvalbard and Jan MayenSyrian Arab RepublicTaiwan, Province of ChinaTanzania, United Republic ofTimor-LesteVenezuela, Bolivarian Republic ofViet NamVirgin Islands, BritishVirgin Islands, U.S.
For a quote request, please specify your delivery address. Please provide details on your needs (gases and substances to monitor and/or to be protected from, application, potential options, etc.) to allow us to handle your request promptly.